Frank Tangram is a puzzle game for your child that mainly educates and introduces basic concepts of shapes to the child. It also helps to develop imagination, visual learning in addition to co-ordination. A Tangram puzzle enhances the memory power with the assistance of the fun-filled activities. It’s best suited for kids in the age group of 5 years and above. A old and ancient style of puzzle that has 7 shapes cut out from squares. It may be used to make different and attractive figures. A Chinese Tangram is among the best roughly puzzle that improves the overall skills of your child. It helps your child concentrate and show case their talent and imaginations. 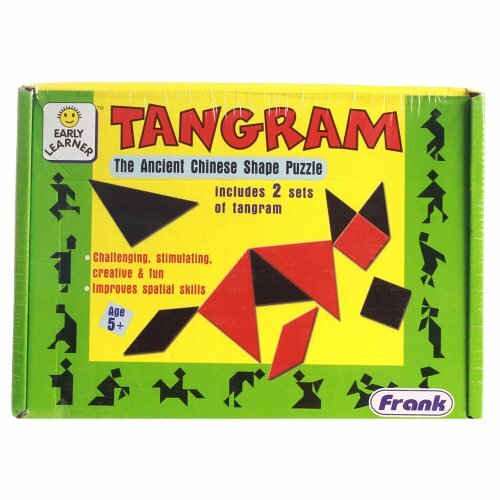 The Tangram games for kids has the quality of keeping child glued for hours. It develops your childs’ thinking capability as solving puzzle requires complete concenteration and thinking. The puzzle for children teaches them to tackle all roughly situation. It is going to give a boost to the problem solving capacity of your child when they play with the Tangram puzzle. The Dimension of the Chinese Tangram is 19*13.6*3.5cm and weighs about 181gms. It is compact and light in weight in order that the kids can carry it to their friends place and play together.